This 127-acre park is home to forested areas of various ages, two man-made ponds and Cuyahoga River tributaries. Three trails total 2.2 miles. Recreation areas opening in the spring/summer of 2018 include a ropes course, pump track/single mountain bike track, freeform boulder wall and Nature-based playground. 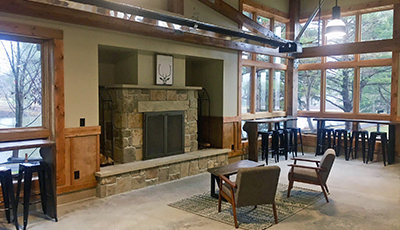 The new Judge Lester Taylor Lodge brags a kitchenette, indoor restrooms and one stunning view. 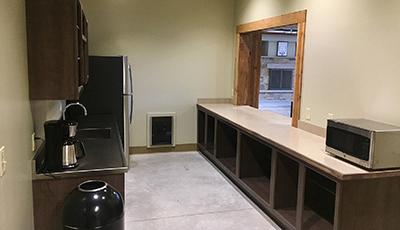 Click here to make a reservation or learn more about a shelter. 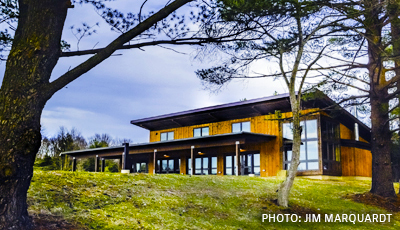 To learn more about a lodge, click the lodge’s name below. 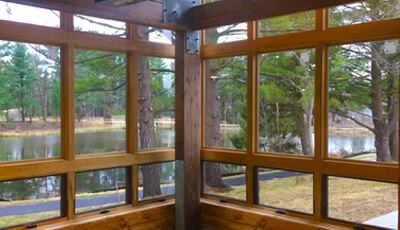 A diversity of trails allow for hiking in the woods and biking over to The Maple Highlands Trail. Dense forest beauty houses about 4,230 feet of pristine Cuyahoga River tributaries, not to mention the habitats created by Upper and Lower Pineside Ponds. Claridon Woodlands is heavily dominated by forest cover, a total of 77 acres, or 60 percent. 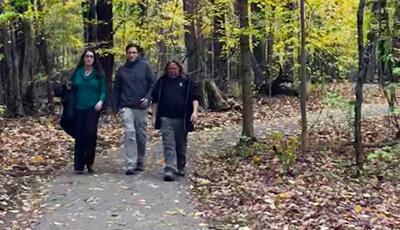 Due to manipulation of the land over the past decade, the property has a variety of forest ages, but the middle of the property was left relatively intact, thus the mature forest stand dominated by beech and sugar maple trees. About 4,230 linear feet of Cuyahoga River tributaries run through this property. 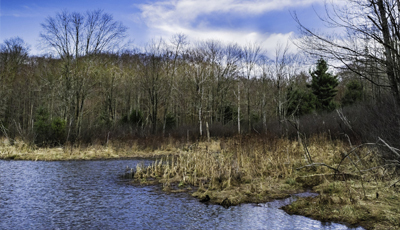 Many headwaters streams and associated wetlands provide key buffers between surrounding human land use and the Cuyahoga River, and provide for vital riparian habitats. Two man-made ponds measure about 3.1 and 1.2 acres. Mixed swamps are Claridon Woodlands’ most common wetlands. Some wetlands were dammed to create ponds, but are now in an early successional state and often grade into the open pond waters, i.e. the western fringe of the smaller pond. Claridon Woodlands is also home to many sedge-grass meadow wetlands. 2019 Update: This year’s ropes course season opens Sunday, May 26, and concludes Tuesday, September 10. Days open will be Friday through Tuesday 12:30 to 8 p.m.; adventures start at 12:30, 1:30, 2:30, 4, 5, 6 and 7 p.m. Please read the rules document below before you head out to the park – thank you! 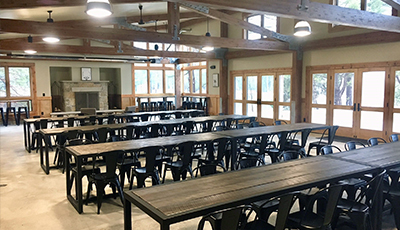 Claridon Woodlands’ ropes course features platforms 32 feet off the ground linked by eight 23-to-32-foot-long challenge elements, aptly named Wobbly Logs, Tarzan Stump Traverse, Icicle Traverse, Beam, Railroad, Ride the Wave, Multivine and Wobbly XOXO. Ready to come back down to earth? Your exit is an exciting 100-foot-long zipline! Ropes course sessions will be available first come, first served, and require a trained staff member’s assistance to ensure fun and safe adventures for all. Hours are posted during the season; please refer to News & Updates for notice of exceptional hours. One-hour sessions will be free to Geauga County residents (ID REQUIRED) but cost $20 per hour for out-of-county residents (credit card only, paid onsite). All participants under the age of 18 years old are required to have their parent or legal guardian sign a waiver. Accompanying adults need not climb the course except under certain circumstances that may require it; please inquire at the course. What is a pump track? It’s a circuit of rollers for mountain bikers to ride by “pumping,” the goal being to ride it repeatedly without pedaling. A connected 2,025-foot-long linear single mountain bike track features several 2-foot-wide boardwalk crossings. Across the way, climbers can test their strength and strategy on a new 12-foot-high, 900-square-foot freeform boulder wall, and a Nature-based playground for kids includes log balance beams, a canoe sandbox, a log tunnel, a play cabin, boulders and other various climbing elements.